Aerial view of paddlers in the East Everglades Expansion Area. As I was en-route to meet 20+ paddlers for this Everglades Paddling Invitational put on by the folks at Everglades Exploration Network (EEN), I was running about 15 minutes late. This, despite getting up super early and pre-loading most everything the night before! Well I know this group runs like a clock and began contemplating what I would do next, if in fact I was too late. However I was really lucky, because I turned off the highway just in time to see a man about to padlock the Frog City entrance gate. It was none other than Keith W., the creator of the Everglades Diary website and the aforementioned EEN. I pulled up and asked him if I was too late? Fortunately his kind reply was to simply slide open the gate and let me in, thanks Keith! As the group was getting ready to launch, the excitement could be felt as none of us had paddled this route before, and that’s the way these invitationals roll! Often paddling through history, and always off map bush paddling! For instance, today we would be paddling through and likely intersecting the very same paths as explorers of old, most notably Col Harney and Lt Willoughby in the Eastern Everglades area. A real treat, to be sure, paddling the less traveled country! Many thanks to Keith W, Terry Helmers, Charlie Arazoza of the South Florida National Parks Trust and South Florida Bush Paddlers Association and all the great paddlers. 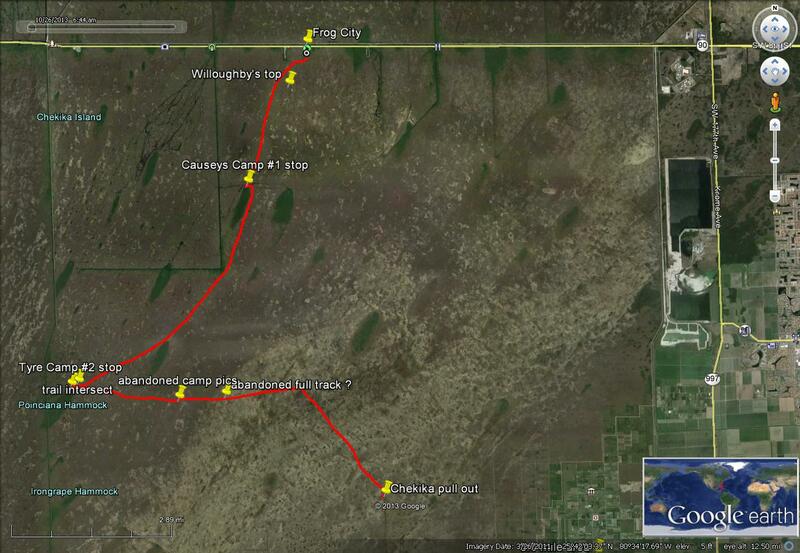 Canoe/kayak trip route in relation to the East Everglades Expansion Area and the rest of South Florida. On this trip we would be paddling entirely within the East Everglades Expansion Area (EEEA), a relatively recent addition to Everglades National Park (ENP). Acquired only in 1989 by passage of the Everglades National Park Protection and Expansion Act, which added nearly 110 000 acres to the Park. Essentially this area is today’s (artificial) “headwaters” for both the Taylor and Shark River Sloughs, because the water flow is managed by the SFWMD and trickles down through the Water Conservation Areas (WCA) just to the north across Tamiami Trail (Hwy 41). With this addition, Everglades National Park now protects all the Shark River Slough and wetlands to the east up to the natural pine ridge, which is also the edge and limit of human development. Even more importantly, in this same area, the highway is slated to be elevated (in sections) as part of Everglades restoration efforts in order to improve sheet water flow down the River of Grass. Earlier this year the very first stretch of the elevated “Everglades Skyway” was opened to traffic and this would be the largest group of paddlers on the water since that opening. We also had a very special guest paddling with us in the person of Everglades National Patk Superintendent Dan Kimball! Leading us into and back out of the wilderness was Terry Helmers , a modern day Glades explorer and organizer of these annual invitational events. 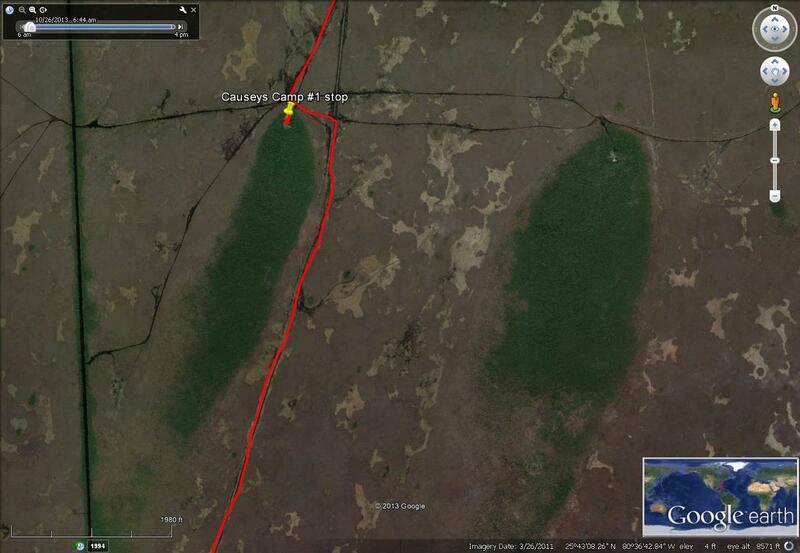 Our actual paddling route from a GPS unit in the East Everglades Expansion Area totaled up to about 15 miles of grass paddling! 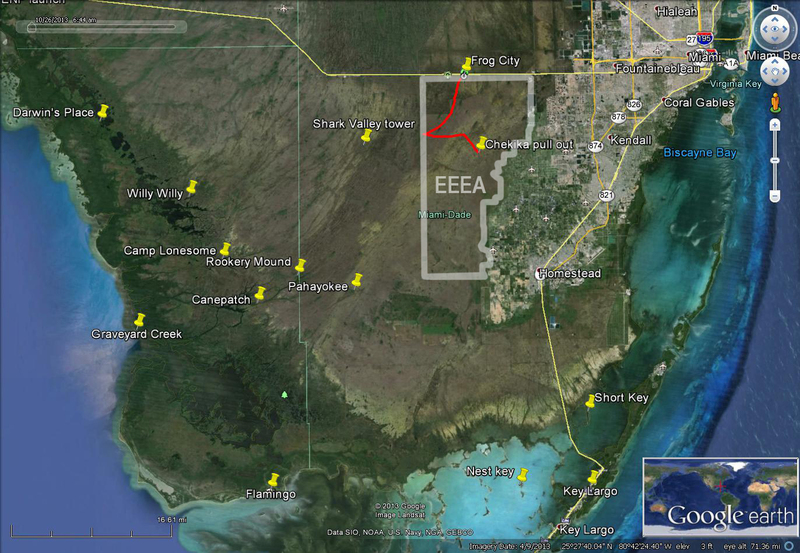 The EEEA area is administratively similar to the Big Cypress Addition Lands, just to the north across the Water Conservation Areas. Both were “recently” added to the NPS, although now going on 25 years! The EEEA is essential to Everglades Conservation and Restoration efforts, as without it the Shark River Slough would in fact be cut in half and flow to Taylor Slough would impeded! Whereas for years, this Eastern Glades, sometimes also called the “Rocky Glades” area was mostly used by hunters, froggers, airboaters and ORV operators, today the list also includes hikers, paddlers, conservationists, environmentalists and Native American interests. This has not been without controversy, even right up to today, although in my opinion all users share the same common goals. The differences arise in access, mode of travel and use of natural resources. With the huge increase in South Florida’s population, there is a great need for quality outdoor recreation and solitude, something that the Everglades still offers plenty of. Hopefully with the right management plan in place, both the Everglades and Big Cypress will soon offer new access points, and recreation and camping opportunities for all types of users! Satellite view of Frog City launch from the old airboat ramp. Please note that a Special Use Permit was required and this is NOT currently an official Park access point! 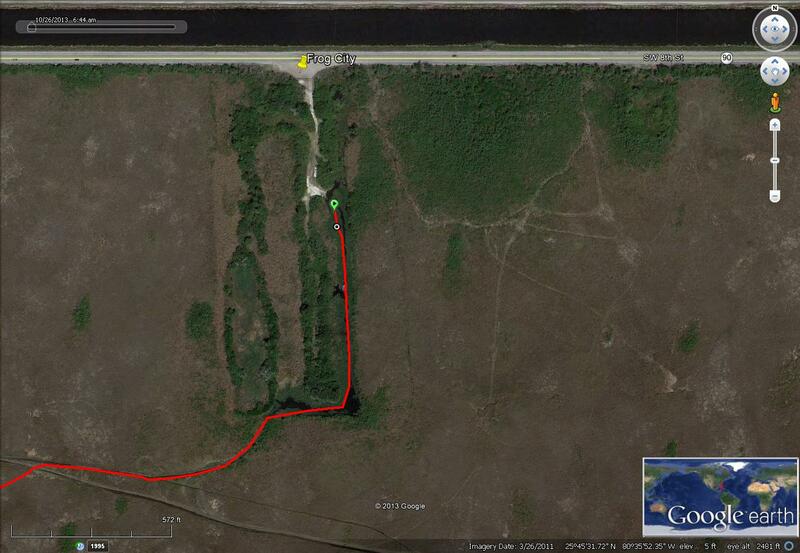 Our group was able to launch at the old airboat ramp at Frog City, just off Tamiami Trail. Please note that this is currently NOT an official access point into ENP, but perhaps one day it could be! We obtained and received a Special Use Permit for this day. “Frog City” is one of the gateways to the East Everglades Expansion Area on the edge of Shark River Slough. Perhaps one day soon it could be made available to the general public. Early morning launch from Frog City airboat ramp. Terry dishes out his Paddler’s Sermon as ENP Superintendent Dan Kimball prepares for a day of grass paddling! “Grass Paddling” means paddling the wide open expanses of the River of Grass in mostly about one or two feet of water. It is very much seasonal and the best time to paddle the sloughs is late October to November, before the water levels drop during the winter dry season. The vegetation encoutered is mostly sawgrass, cat tails, spike rush and water lilies and the landscape is totally flat. Tree island hammocks of various sizes punctuate the flatness . These hammocks are typically where some dry ground might be found and many have been used by wildlife and indigenous humans for thousands of years. Over time most of these hammocks have been linked by trails or water leads as they used to be called. After the second half of the 20th century, many of these trails began to be frequently run by airboats, and these are the ones we see and travel on today. Before the EEEA became part of Everglades National Park, many of the hammocks were either in private hands or had squatters on them. Today, almost all private holdings inside the Park have been acquired by the National Park Service, and eventually the camps on the hammocks either burned down or got flooded. Those that remain today are no longer officially maintained. For about the first hour or so we kept along the eastern fringes of Shark River Slough and paddling was relatively easy with good water depth in the main trail we were on. The easiest grass to paddle through is Spike Rush, it usually means the water is deeper there. The worst is Sawgrass which is grows really thick and displaces water around it. It’s also sharp and can give a nasty cut – gloves are a must! We avoided the Sawgrass areas entirely. but that might not always be possible. For an account of what this was like a hundred years ago, Willoughby‘s book “Across the Everglades” is an entertaining read, and you can download an electronic version. Pond Apple tree in the East Everglades Expansion Area. Stars & Stripes courtesy of the Airboat Association of Florida! Stuffed animals in this tree actually signify a memorial to departed Gladesmen of recent past. This is a good place for a memorial – the tree stands by itself in the middle of the vast prairie slough. CLICK for interactive fun – try it on your iPhone! For this trip I decided to go with my 20ft sea kayak, the “Banana Boat“, an old customized Seda Glider. At 21” wide she’s a quick boat, and still one of the fastest production sea kayaks. Paddling through the grass proved very easy, almost effortless. I also went with a Greenland stick paddle which works excellent in the grass. It doesn’t pick up nearly as much vegetation as euro blades and can of course be used as a “stick” for poling when needed. It also works great as a staff to lean on when standing up in a 21″ wide sea kayak! The lovely Leah paddles by with her short Greenland stick. Canoes or kayaks do equally well in the grass! The group gathers near a small Hammock along the eastern edge of Shark River Slough. At just 2.5 miles south of Tamiami Trail is Causey’s Camp on one of the larger hammocks. You can easily spot it by eye because of the distinctive dome shape of the trees inside. 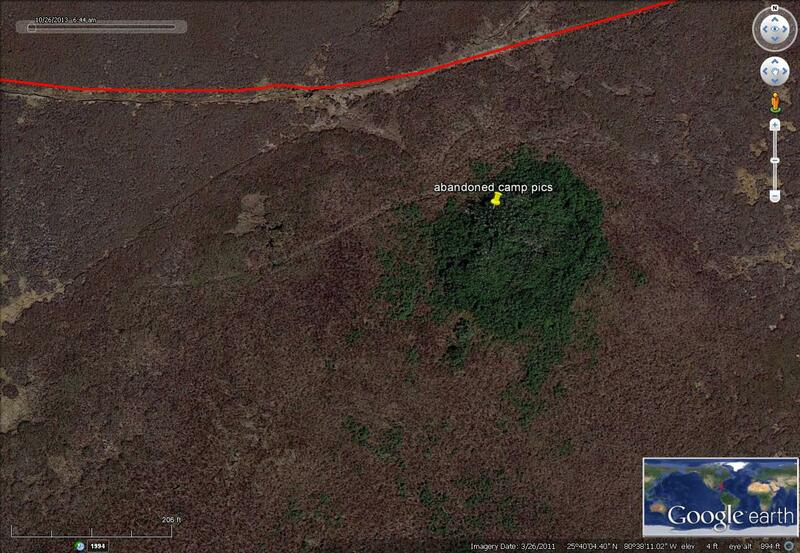 This is a really beautiful island with a large clearing! The grass showed evidence of having been recently mowed, and would make an excellent back country campsite if that were allowed. Perhaps in the near future?! Approach to Causeys Camp in the East Everglades. Landing at Causeys Camp in the Eastern Everglades. Aerial view of the clearing at Causeys Camp – it’s just beautiful! Leah sports the latest in Everglades footwear! Detail showing Causey Camp and Duck Club hammocks in the East Everglades Expansion Area. 20ft sea kayak in the grass! The biggest challenge to paddling a long sea kayak in the grass is that you have to pick your line exactly and stick with it! The long kayak acts a lot like a knife blade – easy to push through the vegetation, but nearly impossible to turn sideways from a dead stop. It really helps to keep constantly moving, and you need to edge the boat because the rudder or rudder strokes are useless and unworkable in the grass. The few times I got off track I had to back up like a semi truck (beep beep .. beep beep) and start my line up again! Travelers through the Everglades faced similar conditions a hundred years ago. Grass Paddling hasn’t changed much except for the people and the boats. As you can see the tall grass easily grows 6 to 8 feet in spots. Swap Lily in the East Everglades – a fragrant native. As explorers of any era would do, we stayed mostly on existing trails. Some of these have no doubt been in use for centuries, although today they would all be considered “airboat” trails. It’s actually thanks to the airboaters that the trails remain clear and open for us to paddle! A good water lead .. precursor to today’s airboat trails, leads to somewhere! Paddling through the tall grasses. Sailing on the River of Grass in the East Everglades Expansion Area. Sailing in the eastern Everglades. Sailing the River of Grass back when the Everglades was still untouched. Fair use American Museum of Natural History. Lily pads come in two colors. Beautiful Water Lily in the East Everglades. 360 birds-eye aerial view paddling on an airboat trail the East Everglades Expansion Area. CLICK for zoomable spin around panorama! Above & below: Bird’s eye view vs Kayak seat views! Pushing through some thicker Everglades grass, seat of the pants view! 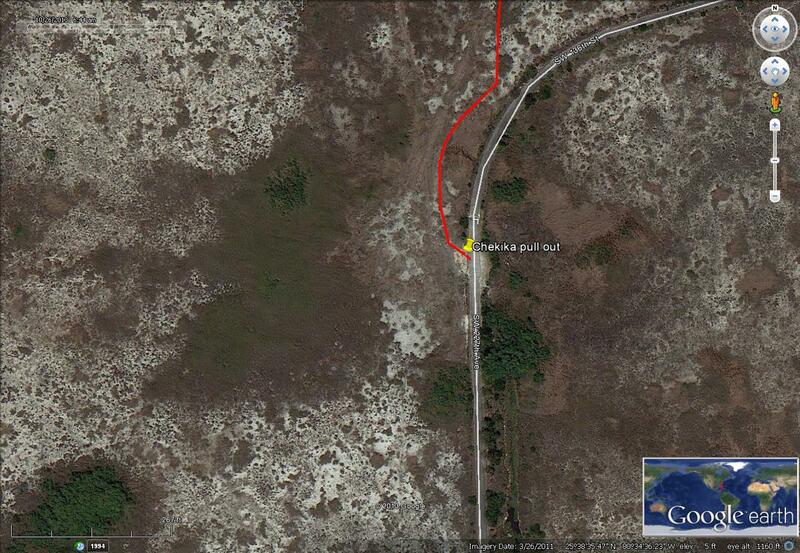 For our lunch break we headed south down to Poinciana Hammock which has a derelict hunting camp on the north tip. The approach to this one is completely different from the previous camp. The water is deeper and has a long “canal” leading into a center “gator hole” with an old wood dock. It’s very picturesque and there were a couple of small gators swimming around. We didn’t see any adults nor any Pythons. 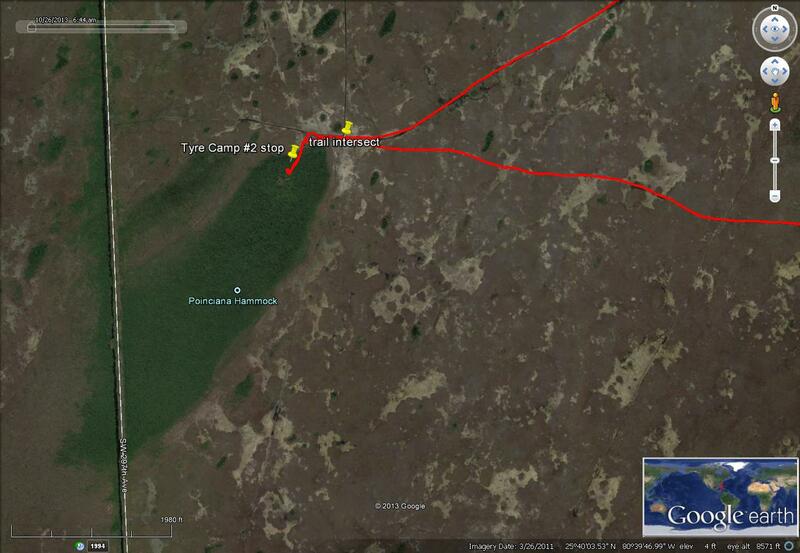 Satellite view of Tyre Camp on the tip of Poinciana Hammock in the Everglades. Canoeist and photographer Connie M. in the East Everglades. Gator hole and the dock on Poinciana Hammock. Aerial old time view of dock in East Everglades hammock. Today or one hundred years ago ? some things don’t change. Rain water catchment system at Tyre Camp on Poinciana Hammock in the Eastern Everglades. This place had it all including modern plumbing! Derelict camp on hammock in the East Everglades Expansion Area. It probably wasn’t that long ago when this was a nice, clean Everglades camp. A peek inside at the sleep bunks. Looks to have been a real nice camp not too long ago! Behind me was the kitchen and dining area. It was a little strange to see a full refrigerator that was left open in the Everglades?! There’s a lot of frying potential here!! Although today it is very unusual to see canoes or kayaks out in the EEEA, there’s really no reason why paddlers couldn’t enjoy paddling and camping this country. It’s just a matter of policy, education and safe access for canoes, kayaks, skiffs and SUPs. Many of the hammocks would make excellent back country campsites just as they have for decades hosting all those old hunting camps and for millennia before all that! Surprised airboat operator meets 20+ paddlers and Park Superintendent! Airboat operator chats with Dan Kimball, Park Superintendent at Tyre Camp on Poinciana Hammock in the East Everglades. As we headed out of the camp, another airboat operator was about to approach the hammock. Airboats are very loud, like an airplane, so you can hear them from a long way off. The operator obviously won’t hear a thing, he has ear muffs on! Best bet for letting them know that you are there and where you are is to wave the paddle up high vigorously. A red flag on at least a 10 foot pole would be good to have too. Airboats are required to have them! Private airboat operating in the East Everglades Expansion Area. Note the the red flag to alert others in the tall grass! Group waving their paddles at approaching airboat in the eastern Everglades just outside Poinciana Hammock. Kayaking on another airboat trail at nearby Shark Valley. This is also inside the Park, but no public airboating takes place here. It’s where Hugh Willoughby camped in 1898! Going “around the bend” ..
Out on this sea of grass, it’s important to be able to stand up and see over all the tall grass! This is easy in a canoe, but much harder in a narrow sea kayak. Fortunately, the shallow depth and extensive vegetation cradle the hull and make this easier. Using the paddle as a support pole also helps. Beautiful aerial panoramic of the River of Grass, East Everglades Expansion Area. CLICK for interactive 360 fullscreen panorama! I was able to set up for kayak aerial photography and get some great birds-eye aerial pictures in a few different spots. Big thanks to Vivian Oliva, Glades explorer and canoeist for the great shots of me in action that you see below. You can check out my Aerial Panoramas page if you’d like to see how I do these. Leah stands up in her sea kayak and surveys the scene. Above & below: more Bird’s eye view vs Canoe level views! Kayak aerial photography setup for the above panorama. Kayakfari aerial photography being done! Just off a trail was an inviting hammock that a couple of us got in to explore. This one hasn’t seen anyone for many years, there are just rusting relics lying around. But how did they get a truck and trailer all the way out here back then? Still it makes me wonder about why perfectly good and sound camps have to fall into disuse (since they are no longer privately owned) when they could be used for interpretive exhibits, education and camping. Other old camps like this one are basically a garbage dump that has not been removed from the Everglades. It’d be a shame for the public to miss out on this opportunity to preserve a bit of the “Gladesmen” era! Approaching a small hammock with an abandoned camp hidden inside. There is a lot more human history to Everglades National Park than a lot of people realize! Abandoned hunting camp in the East Everglades Expansion Area. All that’s left of an old truck .. rust in pieces! The only trash that we found out in the EEEA was in the old camps and consisted mostly of cheap beer cans! CLICK for story: All that trash – the ugly side of kayaking in Miami! This old camp is being reclaimed naturally, even if it hasn’t been cleaned up yet. Standing up in my 21″ wide sea kayak, paddling on an ocean of grass in the Eastern Everglades. One hundred years ago, these intrepid travelers through the Everglades ran out of water and had to get out for a slough slog. In the last third of the trip we came pretty close to walking but were fortunately able to push on through the thick grass growth. Paddling through tall grass in the East Everglades Expansion Area. For those interested in Everglades history, a must read is the book “Gladesmen” by Glen Simmons and Laura Ogden. Glen lived the life! Another great book about the Glades is “Man in the Everglades” by Charlton Tebeau and “They all Called it TROPICAL” by Brookfield and Griswold. This last one was published in 1949, just after the Park was established so it has a different perspective than the more current politically corrected reads! This old swamp buggy was abandoned here a long time ago. It was actually a full track vehicle, typically used in this area. After a while we came upon a strange sight – an abandoned Glades buggy so old that it may already qualify as a historical landmark! Flat head 4 cylinder engine. The rusting buggy may have once looked like one of these in similar terrain! The spark plug frames a short snack break. All the breaks are short when Terry’s in charge! I am glad to report that we didn’t see any visible trash save for a rogue birthday balloon, which was picked up. The only junk we saw was some inside the hammock camps, but even that was fairly limited. Being out here felt cleaner than being out on the ocean! Birds-eye view over paddlers in the East Everglades Expansion Area. The “Rocky Glades” lives up to the name in the last section of trail. Water was maybe a foot and a half, and you could see the limestone rock underneath the hulls. I could see how one might drive over this terrain when the water drops some more. For me it was uneventful except for some sections of hand-to-hand combat pulling myself along through the thick grass. At this point I was only using my hands in a crawl-like stroke to pull myself through this grass. It worked! Take out at the old Chekika Recreation Area off SW 227th Ave. In the end we finished well before sunset to begin the car shuttling process. We covered about 15 miles total from start to finish. What a fantastic day in the Everglades! Also on this trip was Susan Cocking of the Miami Herald and you should read her entertaining account as well! Satellite view of take out at Chekika Recreation Area – aka the old “shooting gallery” (there’s no shooting allowed anymore). © 2013-2016 Flex Maslan / kayakfari.com / awakenthegrass.com / decoratedreality.com. All original photographs, artworks and music in this portfolio are copyrighted and owned by the artist, Flex Maslan, unless otherwise noted. Any reproduction, modification, publication, transmission, transfer, or exploitation of any of the content, for personal or commercial use, whether in whole or in part, without written permission from the artist is strictly prohibited. Well, I am obviously not going to get any work done this morning, I am thoroughly entertained and amazed by your photos and story of the adventure. Excellent work Flex! It was a great time when we paddled it and a great time to relive it! Flex great write up and photos as normal. I have been away from the Glades too long. Awesome! Great historical perspective and photos.